Small business owners rank their accountant as the #1 most important job to their success. Accountants rank above lawyers, bankers, IT managers, and all other staff, by a wide margin. Why? It’s because they’re entrusted with all company financials and are responsible for keeping everything on track. A bad accountant is bad for business. In-house accounting is the traditional form of business bookkeeping, but companies are increasingly turning to outsourced accounting solutions. Each of the two options comes with pros and cons, so it can be hard to know which type of Oklahoma accountant is the best fit for your business. In-house accountants - those who are employed by your company - vary widely in their backgrounds and skill sets. Unless you’re hiring a new employee who’s fresh off the job market, it’s hard to control who’s already sitting in that position within your company. A company’s in-house accountant might be a certified public accountant (CPA) with a thorough understanding of the generally accepted accounting principles (GAAP), or they could be a self-taught accountant that was simply hired because they’re friends with the CEO. Those are two drastically different situations. Outsourced accounting offers a consistently high quality of work. These firms exclusively employ exceptionally skilled CPAs, so their clients get the benefit of quality accounting services. Plus, accounting firms require their employees to stay 100% up to date on training and certifications. An in-house accountant typically works a 9-to-5, 40-hours-a-week schedule. When they’re available, they’re probably just steps away and eager to help - but when they’re out of the office, you’re left hanging. By outsourcing, you usually work with a team of accountants that offers extended hours. This is particularly important for companies where typical business hours don’t apply, like restaurants, entertainment, web-based businesses, and hair and beauty services. Here’s an accounting-related issue you might not have considered: preventing fraud within your organization. It’s an unfortunate fact that you’re much more likely to experience fraud when you use in-house accounting rather than outsourcing. The reason is that an employee can be far more tempted to “cook the books,” embezzle, or commit other types of fraud. Employees have more access to confidential information and can more easily persuade others to go along with a scheme. As an example, look the embezzlement scandal that rocked ING, which is itself a financial services company. Nathan J. Mueller, an in-house accountant, was able to steal $8.5 million from the company by having checks and other funds rerouted to him. An internal investigation at ING revealed that Mueller did it simply by tinkering with the company’s own payroll and mail systems. This is one of the most common methods of fraud, according to the Association of Certified Fraud Examiners. The ING situation couldn’t have happened with an outside provider. They wouldn’t have had access to the company’s other systems - plus, they always have an incentive to avoid any kind of impropriety: their reputation in the industry. 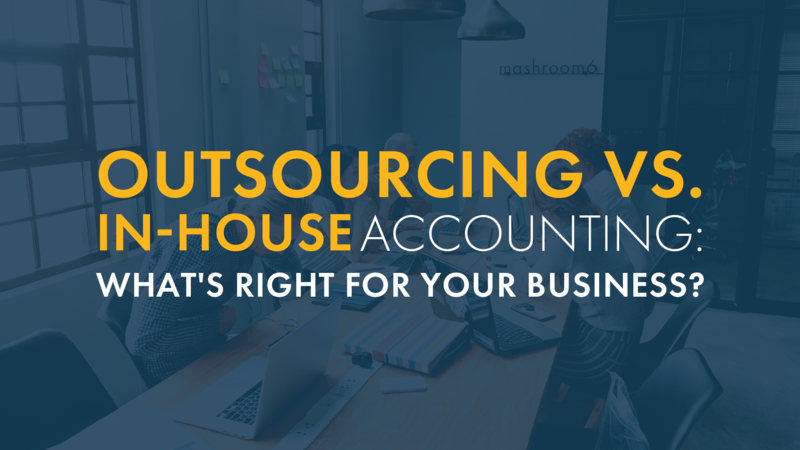 Make sure you accurately balance the costs of in-house accounting vs. outsourcing. It’s not just about how much you pay an employee per year. What about benefits, like health insurance and 401K? There’s also the productivity cost of paid time off, when your employee is unavailable during sick time and vacations. If your in-house accountant is low paid but highly skilled, you’re lucky. The cost may be well worth it. Otherwise, look into outsourced accounting, which typically charges an up-front fee, plus an hourly rate. Ascension CPAs & Consultants uses an all-in-one flat monthly fee structure that provides total cost clarity. We help businesses operate smoothly and profitably, reducing their tax burden and providing accounting consulting services with a personal touch.